The Obama Administration has touted the value of basic research in sustaining an innovative economy, and suggested that federal funding is the key to adequate basic research, echoing a commonly held belief. But just as this view has taken hold, the role of basic research in the development of consumer products has transformed. New 2013 data from the National Science Foundation (NSF) shows that businesses are quickly approaching parity with the federal government on spending for basic research. For 2016, the White House aims for a total of $32 billion spent on basic research programs. Compared to 2013, the 2016 proposed budget outlays are significantly lower. Meanwhile, businesses upped their basic research spending to $28 billion in 2013 for an increase of nearly 75 percent over the previous year. With overall research and development (R&D) spending at near historic highs, the widely held belief that the US is slipping behind in the global research race just doesn’t comport to the facts. Rather, in advanced economies, the very nature of innovation is changing, and so too should the mix of private sector and government innovation investment. As the NSF’s recent data indicate, R&D spending was 2.72 percent of GDP in 2013, just shy of the all-time high of 2.81 percent in 2009. Internationally, the US continues to rank at the top of overall outlays in R&D spending, and as a percentage of GDP, outranks both the European Union as a whole and China. For 2013, the yearly growth in R&D was 3.2 percent, placing it squarely within the 2003 to 2008 trend of 3.9 percent per year, and continuing a general upward tick in R&D since the 1990s. By a clear landslide, business contributed the majority of this increase, with a 5.1 percent bump from 2012. 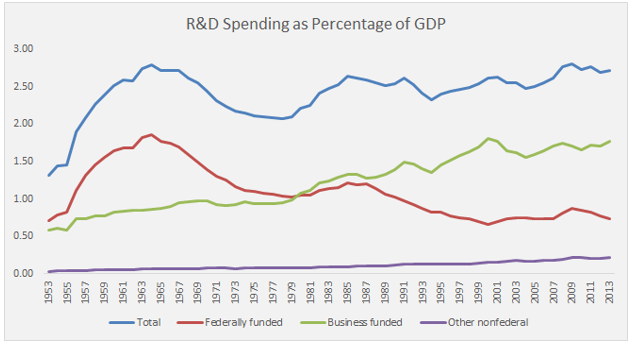 Much like other years before it, 2013 saw the predominant share of R&D come from business, at 65 percent. Overall funding for basic research increased by 5.8 percent between 2012 and 2013, driven by industry increases of nearly 75 percent. This one-year increase was substantially higher than the average annual increases from 2001 to 2012, which were 2.59 percent. In total, industry contributed 35 percent of the basic research to the federal government’s 47 percent in 2013. Overall, academic R&D has seen strong growth compared to other sectors. After adjusting for inflation, this sector grew on average 2.2 percent annually from 2008 to 2013, ahead of total R&D, which grew at 0.8 percent, and GDP, which grew at 1.2 percent. While the relationship between R&D spending, innovation, and economic growth is often taken as a simple, direct linkage, in a globalized world, the relationship between the three is far more complex. In previous generations, science-based product innovations were a source of growth. Increasingly, however, firms are becoming flexible assemblies, connecting skills, capacities, and funding from sources around the world. In this regard, US firms continue to dominate in business model and process innovation. Over time, funding has shifted from basic research, a scattershot approach to research, towards applied research and development, where an end product is realized. As the US faces the change in administration in 2017, a realistic innovation policy for this century will have to look past the raw R&D numbers and put into place a holistic plan that understands this changing context. $74,849,000,000 2012 US Dollars was $76,069,050,000 in 2013; $15,962,000,000 2012 US Dollars was $16,222,180,000 in 2013, both using GDP deflators.